I predict that in the not too distant future, we will all have implanted computers that connect us with one another. Will you be an early adopter? Please note: “Google” is the intellectual property of Google, Inc. Resemblance to the Google Organ of any product, real or imagined, is purely coincidental. Michal Levin, a senior user experience designer at Google admits that wearing Google Glass “gets pretty tiring pretty fast,” in an article by Cameron Scott on Social Times. But once the bugs are worked out, we’re going to come another step closer to what I call the Google Organ. I imagine a time in the future when we have implantable organs that can do everything that Google Glass can do, and so much more. As I’ve been telling my friends for at least a year, the Google Organ is our future. Will you be an early adopter? The Google Organ, or Organs—many manufacturers will probably be making items like these—will have multiple functions from entertainment to saving lives, just like our smartphones do now. Imagine a computer the size of a grain of rice, under your skin, that delivers heads up displays, connects you to the internet, and with applications to monitor your bodily functions and even control the WiFi enabled machines around you. We’ll all be GPS monitored, and everywhere we go, not only will we know exactly where we are, and have contextual information for our locations, but others can know where we are, too. We can click “OK” on the privacy agreements that give our credit card numbers to the agencies that collect highway tolls, to our gyms and workplaces, so that wherever we go, doors open to us, and our fees are paid. ATMs will recognize us. We’ll walk out of stores without even having to pause, because the items and we will all be tracked by RFID. Dynamic billboards will change their displays as we walk past, based on as much information as we elect to share. If you’re ever in an accident, EMTs will know who you are, your insurance provider, primary care doctor, and full medical history, including allergies, conditions, and the medications you’re currently taking. Such a device could potentially sense everything from your blood alcohol level to your sodium levels, dynamically regulate your insulin pump, pacemaker, APAP machine, and any other device in your house to manage your health and well being. It could send emergency notifications to your doctor or summon an ambulance. Being inside you, there would be no more track pads or thumbing keyboards. Instead, we’ll commune with our smart devices in some subtle way, such as a subvocalization, eye movement, thought, or even without your conscious direction. It will revolutionize how we live, and it’s all possible with current technology. Not long ago I interviewed a panel of dads about technology. One of the questions I asked was, would you have your kids “radio chipped”? 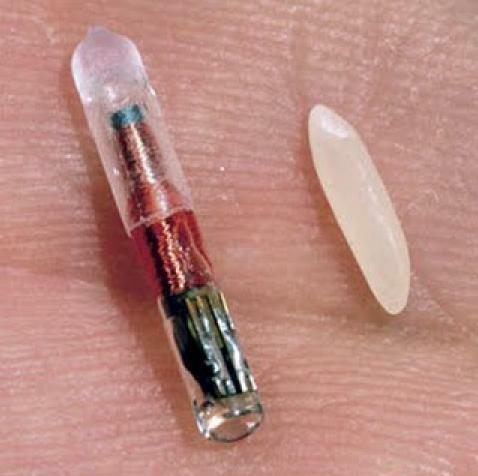 My dog and one of my cats (who came through a shelter, rather than informal adoption) have these chips implanted, so that if one of them wanders off, they can be identified with information stored on the microchip implanted under their skin, and we, their owners, contacted. You can see how small these things are. It’s only a matter of time before they contain not only information, but processing power. In 1951, the original UNIVAC filled a largish room, and had less processing power than my Android. These are bound to get smaller and more powerful, more quickly, until the Google Organ becomes possible, and then more essential to who you are than your pancreas. The biggest change is going to be one of social acceptance—of the loss of privacy that is inherent in using such a technology. Once it reaches a tipping point, use of any technology will become the norm, without any of us really noticing. When did it become unsafe to ride a horse on the road, because of the preponderance of automobiles? When did we all start peeing in cups to get employment? When did we all start shopping online with our credit cards, and stop worrying about sending our numbers off into the ether? Or waving a key fob at the gas pump to pay for our fuel? Few of us understand the technologies we live with and rely upon, including ones that didn’t exist twenty years ago, or ten. That isn’t even the issue. It’s simply one of adoption. Someday soon, the question won’t be, “would you chip your kids?” but, “would you let your kids get the Google Organ?” The question won’t sound like that. They’ll call it something else. The first ones will be buggy and hard to live with, like the first Google Glass. But you can be sure that once they smooth out the rough edges, all the kids will be doing it. And so will you. Because like cell phones and GPS navigation systems in our cars, it’s darned handy to have the technology you need, “at hand,” so to speak, and getting smaller and more hands-free with every iteration. Finally, like Facebook, these devices won’t be cool anymore, because everyone and their mom will have them. We’ll all be muttering or eye flickering away, only fully present online, directed by satellite not to trip over the cracks in the sidewalk: radio controlled zombies to the outside observer, easier to contact and learn about than strangers have ever been, but only to those who have adopted the technology. No one will ever be quite alone, or lost, like we can be now, they’ll say when they sell you this. With any luck for the inventor of the Google Organ, it’ll be a technology that nearly everyone will adopt.